CAPE CANAVERAL — Riding the rails to the launch pad Wednesday morning, the Atlas 5 rocket was rolled out to Cape Canaveral’s Complex 41 for liftoff Thursday night to deploy four NASA satellites that will probe Earth’s magnetosphere for a high-priority research project. Liftoff of the Magnetospheric Multiscale mission, or MMS, is slated for 10:44 p.m. EDT on Thursday, at the opening of a 30-minute window. The United Launch Alliance booster was wheeled out aboard a mobile platform, emerging from the assembly building where the rocket’s two stages, twin strap-on boosters and the payload were integrated over the past five weeks. 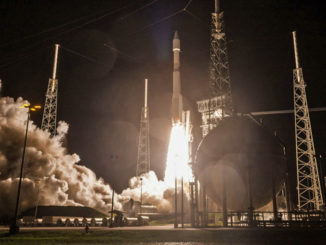 The slow drive from the 30-story Vertical Integration Facility to the launch pad, which began at 10:01 a.m., used a pair of specially-made “trackmobiles” to carry the rocket’s 1.4-million pound mobile launching platform along rail tracks for the 1,800-foot trip. The 195-foot-tall satellite booster will launch the MMS mission into a highly elliptical Earth orbit. Deployment of the spacecraft quartet begins an hour and 32 minutes into flight and concludes 15 minutes later. The rocket is flying the 421 vehicle configuration for the fourth time in 53 flights. The version features two stages, two solid rocket boosters and a four-meter-diameter nose cone. It is powered off the launch pad by an RD AMROSS RD-180 main engine and twin Aerojet Rocketdyne solids. 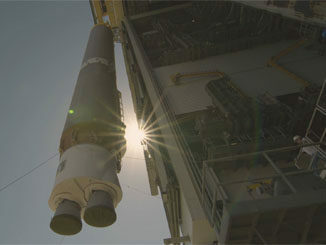 The Centaur upper stage is equipped with an Aerojet Rocketdyne RL10A. 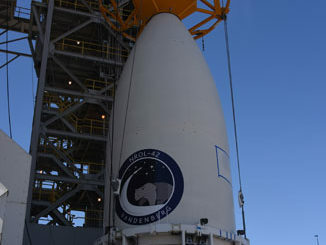 Countdown clocks begin ticking at midday Thursday, leading to activation of the rocket, final testing and system preps. 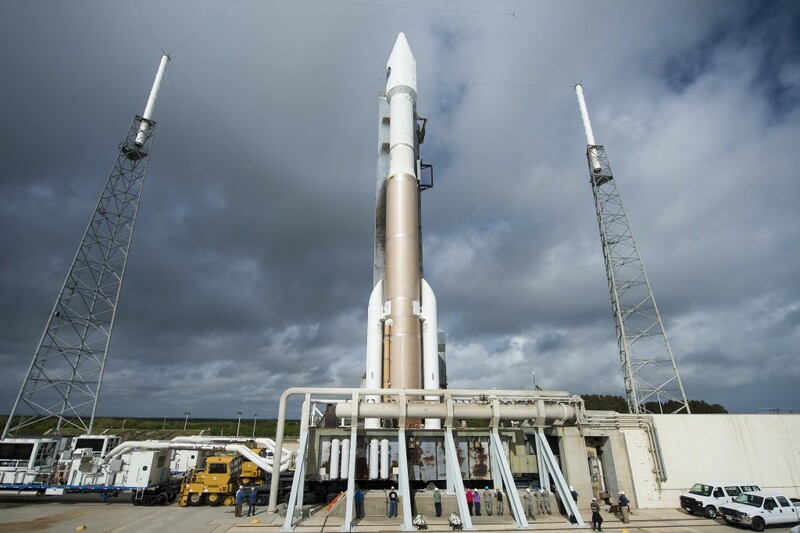 The day’s available launch opportunity begins at 10:44 p.m. and closes at 11:14 p.m. EDT to send the rocket on an easterly heading into an equatorial orbit. The satellite constellation will fly through regions of magnetic field explosions in space to sample with its instruments the phenomenon called magnetic reconnection. “This a fundamental process and MMS is going to revolutionize our understanding of it,” said Jeff Newmark, interim director, Heliophysics Division, NASA Headquarters in Washington.